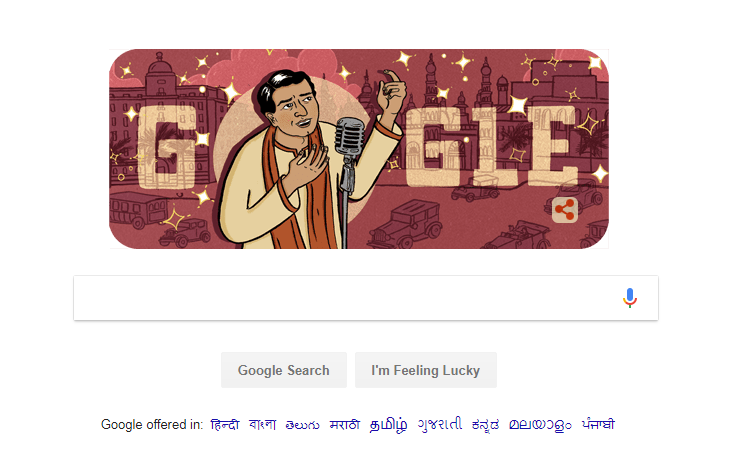 Search engine giant Google today honoured 114th birth anniversary of noted Indian singer and actor KL Saigal with a doodle. Who is KL Saigal ? Kundanlal Saigal, often called as K. L. Saigal, was an Indian singer and actor who is considered the first superstar of the Hindi film industry. Search engine giant Google today on 11th April honoured noted Indian singer and actor KL Saigal with a doodle on his 114th birth anniversary. On April 11, 1904 he was born to Amarchand Saigal and Kesarbai Saigal in Jammu . His father was a tehsildar at the court of king of Jammu and Kashmir. In his childhood Saigal used to play the role Sita during Ramlila. In 1930’s he was introduced to RC Boral by music director Harishchandra Bali. He got a job in B N Sircar’s film studio New Theatres on a contract of Rs. 200 per month. While working there he came in contact with contemporaries like KC Dey, Pankaj Mullick and Pahari Sanyal.